It's tempting to do as much exercise as possible to lose weight. However, working out three or more hours a day may change your body's response to your exercise routine, making it store fat instead of burning it for energy. In addition, excessive amounts of weight training may result in significant muscle gain, which also contributes to your weight loss stopping or even to gaining weight. When weight loss stops, look at your training style and dietary intake to determine the cause. Whether your goal is to lose weight or improve performance, more training is not always better. Training three or more hours a day, five or six days a week, offers no greater benefits than training an hour to an hour and a half a day. In fact, research done on swimmers has shown that excessive training can significantly decrease muscular strength and performance, according to Jack H. Wilmore and David L. Costill, authors of Physiology of Sport and Exercise. Exercising to the point where the body cannot adequately recover may result in a decrease in weight loss and in muscle tissue. If you have been exercising for more than three hours a day and have stopped losing weight, it could be because your body is storing fat instead of burning it. Exercise that exceeds an hour in duration can cause the body to stop burning fat for energy. After an hour of exercise, your body becomes aware that you are going to extremes. It then attempts to conserve its fat reserves and begins to burn muscle for fuel. Diet also plays a large role in weight loss. Weight loss that occurs with extremely low calorie diets is usually from water loss and not fat, according to Costill and Wilmore. Eat five to six small meals a day. Each meal should consist of a lean protein source to help maintain muscle tissue and a whole-grain carbohydrate source to help fuel your workouts. Additionally, consume plenty of fruits and vegetables daily -- along with plant oils, nuts and seeds as a healthy source of fat. If you are exercising three hours a day and not taking in enough calories to support that activity, then your body could go into starvation mode while trying to preserve its fat stores. 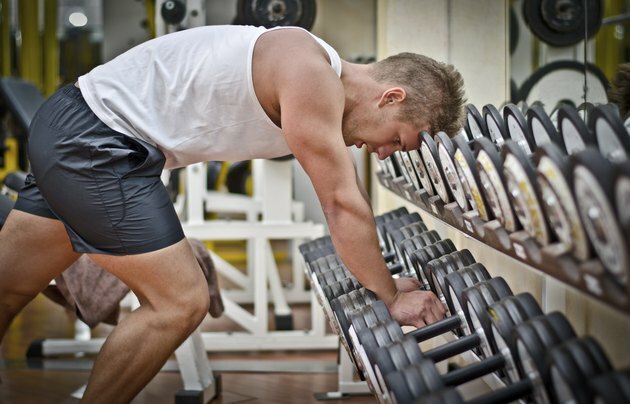 High volumes of weight training may also contribute to weight loss not occurring. Muscle tissue is more dense than fat tissue, and building muscle tissue will help increase your resting metabolism which can result in fat loss. However, building a substantial amount of muscle mass will not necessarily result in lower body weight -- you're more likely to experience a reduction in inches instead. When trying to lose weight include both strength-training and aerobic exercise in your routine. Strength train at least twice a week targeting every muscle group to build and maintain muscle tissue. Perform moderate-intensity aerobic exercise five or six days a week for 30 to 60 minute sessions. Take at least one complete day off every week from exercise to prevent over-training.